Ukrainian President Petro Poroshenko has canceled his working visit to Turkey because of an escalation of fighting in the Donetsk Region in eastern Ukraine and has called an extraordinary session of Ukraine's National Security and Defense Council. RIR brings you the latest on the situation in Ukraine. From 12:10 p.m. to 4:09 p.m. GMT, RIR provided a live-feed of developments regarding Petro Poroshenko’s announcement of the presence of Russian troops in Ukraine. 4.09 p.m. GMT: The official representative of the Defense Ministry, major-general Igor Konashenkov, told RIA Novosti that the Russian Defense Ministry has denied the authenticity of the list of Russian forces groups which had reportedly been re-located closer to the border with Ukraine. He also claimed that most of the command units from the list are currently carrying out their own tasks in the peripheries of their field. 3:45 p.m. GMT: Kiev's claims of a Russian military invasion are just a means of fooling their own people, Deputy Director of the Information and Press Department of the Russian Ministry of Foreign Affairs Maria Zakharova has written on her Facebook page. "It looks like Kiev vitally needs a 'Russian invasion'. It looks like a part of a bigger plan to dupe Ukraine's citizens and the main answer to people's question 'Why the hell is it happening to us?' I'm already scared at the thought of the statements Ukrainian officials will make on Halloween," she wrote. 3:38 p.m. GMT: Russia's State Duma (parliament) is not planning any session following the statement by Ukrainian President Petro Poroshenko that Russian troops have invaded Ukraine, Duma official Yury Shuvalov told RIA Novosti. 3:27 p.m. GMT: An emergency meeting of the UN Security Council at which reports of the possible Russian military invasion of Ukraine will be discussed has been set for 6 p.m. GMT. The meeting was announced by Mark Lyall Grant, permanent representative of the United Kingdom to the United Nations. According to him, the participants are awaiting explanations about the presence of Russian troops on the territory of the neighboring state. Ukraine plans to provide evidence of this at the meeting. 3.13 p.m. GMT: Ukrainian President Petro Poroshenko has established the task of restoring the activity of Ukrainian border crossing points in the east of the country and organizing joint patrols with Russian border guards "to make the penetration of hardware into our territory impossible." According to Poroshenko, the issue should be discussed during a meeting of the border authorities of Ukraine and the Russian Federation on August 30. 2.59 p.m. GMT: Russian President Vladimir Putin does not currently have parliamentary permission to use military force in Ukraine. In mid-June, the President of Ukraine Petro Poroshenko ordered a ceasefire for a week for all units involved in military operations. After this, the Federation Council cancelled its resolution allowing Putin to deploy Russian armed forces in Ukraine, which was initially adopted on March 1. "The Federation Council and the Federation Council Committee on defense and security have not recieved such a request," said Yevgeny Serebrennikov, the deputy chairman of the Federation Council Committee on Defense and Security, to RIA Novosti. "There are no Russian armed forces in Ukraine," he stressed. 2:54 p.m. GMT: A source in the Ukrainian presidential administration earlier told Ukrainian TV channel Vesti that Petro Poroshenko will not raise the question of the imposition of martial law in the country. He clarified that the decision of the Security Council will not be disclosed. "There will be no public decisions," said the source. The first deputy head of the presidential administration of Ukraine had earlier stated that "martial law would be beneficial for the Russian Federation because a country that imposes martial law cannot receive military assistance from any other country." 2.30 p.m. GMT: At a meeting of the Ukrainian National Security and Defense Council in Kiev, Ukrainian President Petro Poroshenko said that the first consultations of the General Staffs of the Armed Forces of Ukraine and Russia were held on Thursday. He also confirmed that the first consultation of the border services of the two countries will take place on August 30. 2:06 p.m. GMT:The situation at Novoazovsk in the south of the Donetsk Region is tense now, and mortar shelling is taking place in the surrounding villages. According to the Mariupol city portal 0629.com.ua, Ukrainian armored divisions have arrived in Mariupol (close to Novoazovsk) to defend the city. According to Ruslan Muzyychuk, press officer for the special operation in Mariupol, military hardware has arrived in the city. Roadblocks have been strengthened by the National Guard and regular troops are ready to defend the city. The Novoazovsk-Mariupol road is controlled by the Ukrainian military. There is no currently no fighting taking place along the road. 2:01 p.m. GMT: RIA Novosti also reported that the UN Security Council will hold an emergency meeting today on the situation in Ukraine. Earlier, Lithuania and Ukraine's Acting Prime Minister Arseny Yatsenyuk had called for such a meeting. 1:52 p.m. GMT: NATO expressed serious concern about the situation in eastern Ukraine, but did not comment on the political situation, according to reporting in the Belgian newspaper Mons. A senior NATO officer was cited, although the name of the officer was not reported. "It is out of the Alliance's mandate," said the NATO officer, however, he said that the question of what political terms could be used to characterize Russia's actions could be discussed at the NATO summit scheduled for Sept. 4-5 in Wales. 1:32 p.m. GMT: According to Andrei Kelin, Russia's permanent representative to the OSCE, there are only 10 Russian paratroopers on the territory of Ukraine and there are no other Russian troops there. "Of the military, it's only 10 paratroopers - one of whom was seriously wounded - who randomly crossed the border in an unmarked area and were captured by the Ukrainian law enforcement bodies," Kelin said in an interview with TV channel Rossiya-24. 1:26 p.m. GMT: Civil society activists are holding individual protests against the war in Ukraine on Manezhnaya Square in central Moscow. 1:18 p.m. GMT: The militia of the self-proclaimed People's Republic of Lugansk launched an offensive near the city of Lugansk. Fighting between the militia and Ukrainian security forces took place in the villages of Krasny Yar and Vergunka, according to RIA Novosti, citing the militia headquarters. "The militia attacked and moved to the offensive, trying to push back the enemy's position in these settlements," the militia headquarters said in a message. On Thursday, the militia announced that it had taken control of three settlements in the Lugansk Region - Slavyanoserbsk, Crimskoye and Kirov. 1:16 p.m. GMT: The declaration of martial law in Ukraine, which was called for by demonstrators in front of Ukraine's Presidential Administration building, would benefit Russia, said Gennady Zubkov, the first deputy chief of staff of the Ukrainian president, according to Interfax. Zubkov explained that a country that imposes martial law cannot receive outside military assistance - a situation that would benefit Russia. 1:13 p.m. GMT: Meanwhile more than 500 activists have gathered in front of the Ukrainian Defense Ministry headquarters on Povitroflotsky Avenue in Kiev to protest against inaction of the ministry and the General Staff leadership in breaking the blockade of Ukrainian government forces in Ilovaisk, the Donetsk region. 12:59 p.m. GMT: NATO representatives stated that there are more than 1,000 representatives of the Russian military in Ukraine, according to reporting by Reuters, citing a representative of the alliance. According to NATO, the military personnel are supporting the pro-autonomy miitias. 12:51 p.m. GMT: Russia's second convoy of humanitarian aid for eastern Ukraine is being formed based on the needs of the local population, said Vladimir Stepanov, deputy minister for emergency situations. "Preparations are on schedule, we've clarified everything that is needed," Stepanov told RIA Novosti. 12.38 p.m. GMT: Ukraine has called on the EU to hold an extraordinary session of the European Council on Aug. 30 to introduce additional sanctions against Russia and provide Ukraine large-scale military assistance, according to comments by Konstantin Eliseev, the representative of Ukraine to the European Union. 12.37 p.m. GMT: The fall in the ruble is linked to the increase in inflation in Russia, and is in no way related to the call by Ukrainian Prime Minister Arseny Yatsenyuk to freeze Russian assets around the world, said Yevgeny Bushmin, deputy speaker of the Federation Council, overseeing the economic sphere in the upper chamber of the Russian parliament. "I absolutely disagree that [Yatsenyuk's] political statements have had an effect on the value of the ruble," Bushmin told RIA Novosti. 12:33 p.m. GMT: The announcement made by Petro Poroshenko about the alleged deployment of Russian troops in Ukraine is a provocation, said Vice Speaker of the Federation Council Yevgeny Bushmin in comments made to RIA Novosti. According to Bushmin, it is impossible that Russian units could be present in Ukraine, as "we do not need a war." Furthermore, the senator added that he had contacted the administration of the Rostov Region as soon as he heard the reports of Poroshenko's statement, and "they know nothing about it there." 12:27 p.m. GMT: Today's meeting of the Ukrainian Council of National Security and Defense (SNBO) will be devoted to the escalation of the situation in the zone of special operations in the east of the country, according to Speaker Andrei Lysenko. He declined to answer a question as to whether martial law would be imposed, reports RIA Novosti. no participation by the Russian military; we are not sending any hardware there," he told ITAR-TASS. 12:12 p.m. GMT: An emergency meeting of the OSCE was held in Vienna. Representatives of the OSCE mission in Ukraine did not confirm the movement of military equipment from Russia to Ukraine. 12:10 p.m. GMT: Ukrainian President Petro Poroshenko has canceled his working visit to Turkey because of the events in the Donetsk region and is calling an extraordinary session of the National Security and Defense Council. "I have made the decision to cancel my working visit to the Republic of Turkey because of the dramatically exacerbating situation in the Donetsk region, particularly, in Amvrosiyivka and Starobesheve," the presidential press service quoted Poroshenko as saying on Thursday. The National Security and Defense Council will gather on Thursday to draw up an action plan in a new situation, he said. 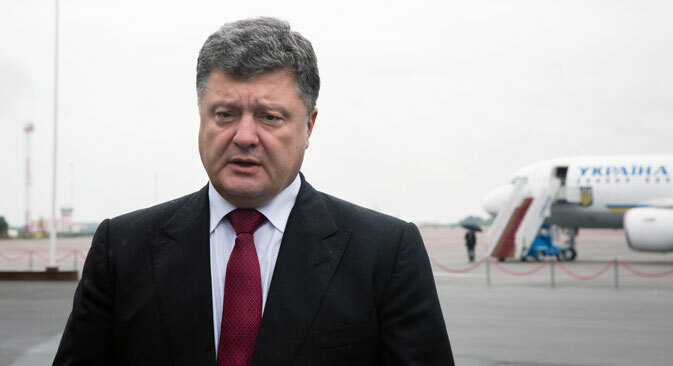 "The president's place is in Kiev today," Poroshenko said. Ukraine is also determined to initiate an extraordinary UN Security Council meeting, the presidential press service said. "The world should formulate its judgment about the dramatic exacerbation of the situation in Ukraine," he said. Ukraine will also appeal to its European partners to convene an extraordinary meeting of the Council of the European Union, he said. Poroshenko said he decided to cancel his visit to Turkey even despite plans to have seven bilateral meetings that were planned on the sidelines of the Turkish president's inauguration ceremony. The president also made a similar video address from the Boryspil airport, standing nearby the presidential plane.